– I’m thankful that Tony Stewart and Carl Edwards each “got up on the wheel” and provided us with a championship battle for the ages. – I’m thankful that Edwards was gracious in defeat by being the first to congratulate “Smoke” on becoming a three-time Sprint Cup champion. – I’m thankful that this year’s Cup champion was determined by number of wins and not average finish. – I’m thankful for the class shown by Stewart’s crew chief, Darian Grubb, who continued to put forth a championship effort each week despite being told earlier in the season he won’t have a job with the No. 14 team next year. – I’m thankful that Kasey Kahne was able to provide Red Bull Racing with a victory. – I’m thankful for seeing Marcos Ambrose, Trevor Bayne, Paul Menard, Regan Smith and David Ragan enjoy the spoils of winning a Cup race for the first time. 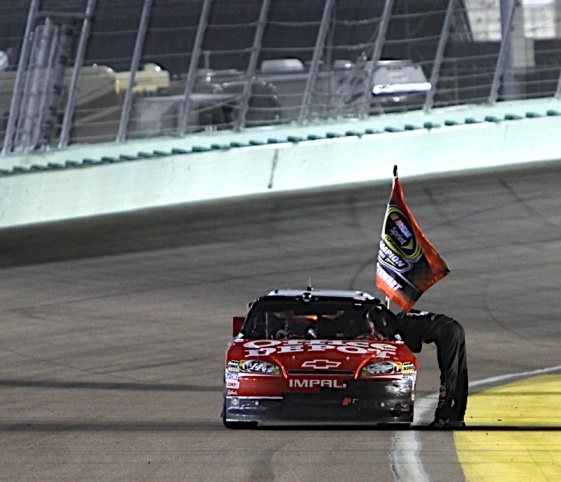 – I’m especially thankful that Bayne’s win in the Daytona 500 put the Wood Brothers back in victory lane. – I’m thankful that NASCAR has finally realized fans aren’t interested in tandem racing at Daytona and Talladega. – I’m thankful to see Ricky Stenhouse Jr. win a Nationwide Series championship just a couple of years after wondering if he’d have a job when he turned Roush Fenway Racing’s shop into a junkyard. – I’m thankful that Johnny Sauter never gave up and won at Homestead to give us a close points battle between himself and new Camping World Truck Series champion Austin Dillon. – I’m thankful that ESPN’s Dr. Jerry Punch showed a lot of class by simply walking away after being verbally assaulted by Kurt Busch. – I’m thankful for Kyle Petty being so candid during his commentary on the sport. – I’m thankful for classy race track promoters such as Atlanta Motor Speedway’s Ed Clark, who held things together after his Labor Day weekend Cup race got pushed into Tuesday due to bad weather. – I’m thankful for turning on the radio and hearing longtime broadcaster Barney Hall of MRN. – I’m thankful for PRN’s Doug Rice for getting it right by saying “end of the longer line” prior to a restart. – I’m thankful that legendary tracks such as Darlington Raceway and Martinsville Speedway are still part of the sport. 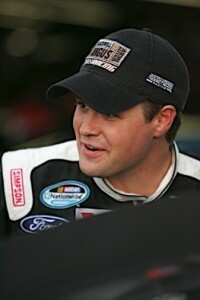 – I’m thankful to see that NASCAR will race in Rockingham, N.C. in 2012. – I’m thankful for being part of RacinToday.com, which features some of the most talented writers in motorsports. – I’m thankful that everyone has few weeks to relax as we all get ready for Daytona in February. I’m thankful for all those gearheads, professional and amateur, involved in bringing excellent, entertaining motorsports events to spectators like me. Sprints, stocks, drag, farm tractors, boats, gas, alcohol, diesel, nitro….bring the show/I’ll be there to see it!